UPDATED, Oct. 22, 2010 — Ciro Pérez was released from prison in October 2010 and forced into exile in Spain. Still not convinced that the Castro dictatorship is a scourge on all humanity, especially the Cuban people? Consider this: Cubans who try to leave the country without the government's permission — Cubans like Ciro Pérez Santana — risk lengthy prison terms, if caught. In May 1994, Pérez was caught and sentenced to 20 years in prison. Not much is available on the Internet about Pérez. In 2001, he went on a hunger strike to protest his treatment by prison officials. And in 2007, he was the source of information about how a mentally ill prison had slashed himself with a knife. The circumstances of Pérez's incarceration may not meet the common perception of a "political prisoner," but that is what he is. He grew up under Castroism and decided he had had enough and tried to leave. 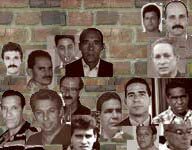 In Cuba, few "crimes" are more serious.